Next No One’s Naked in Here! He also seems to be clearly influenced by Dali and even Picasso. The first two and last one are the most realistic, they’re all really cool though! For the elephant one I was like “Whuuuut???!! !” He uses 3d objects to reinforce the illusion! I wanna try it too! This boy is a genius! An excellent artist, and only 17 years old. I hope he continues to progress and grow. That’s not a goblin holding the lighter, it’s a junkie. Very disturbing images. Who gives a f*ck that it’s a junkie! It’s still a work of art! I suppose that offends you? Give credit where credit’s due,not criticize. Also, the hand in the second picture has 6 fingers! Echoes of your post from a few days ago. Somebody was really paying attention in art class when they taught perspective! How is it supposed to trick your brain? I have some trouble seeing these things so I’m just wondering. I go to an art school and just HAD to share this with fellow classmates. 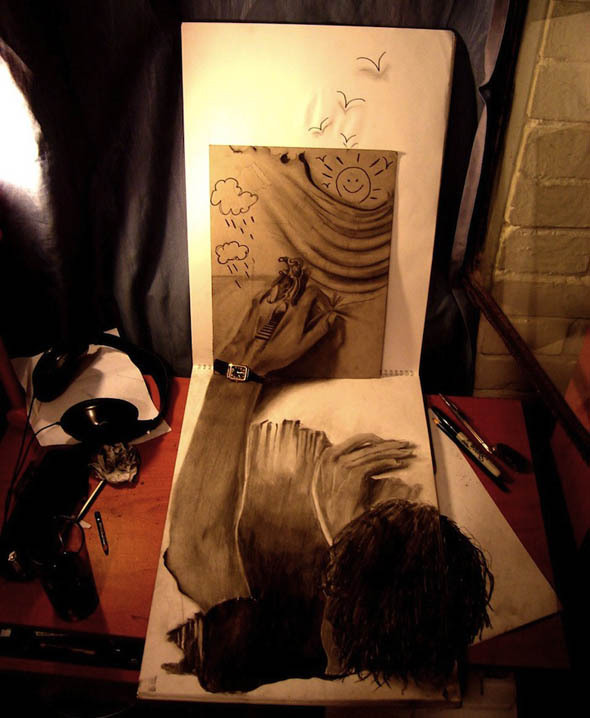 Gosh I wish I could draw like that! Thanks for posting! Oh my gosh those are so cool. Where’d you find them? Any certain website or all over the internet? you should consider becoming a tattoo artist..you’d make lot’s of money!!!! 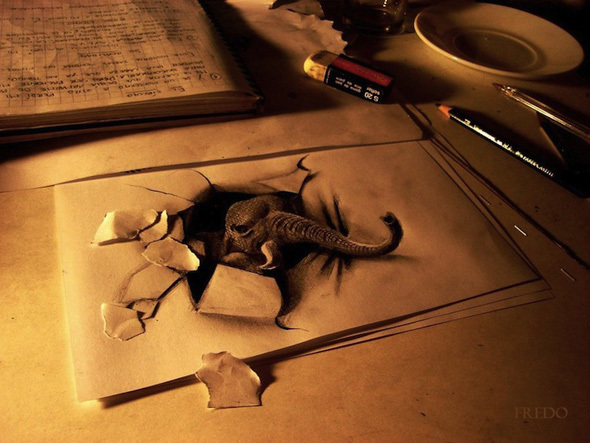 Have you ever see the 3-D art of Julian Beaver? It has been around for years and blows one’s mind!!! He likes eyes, doesn’t he? I know I usually only comment when I question something, but these are some of the most increadible drawings I have ever seen. Very impressive. 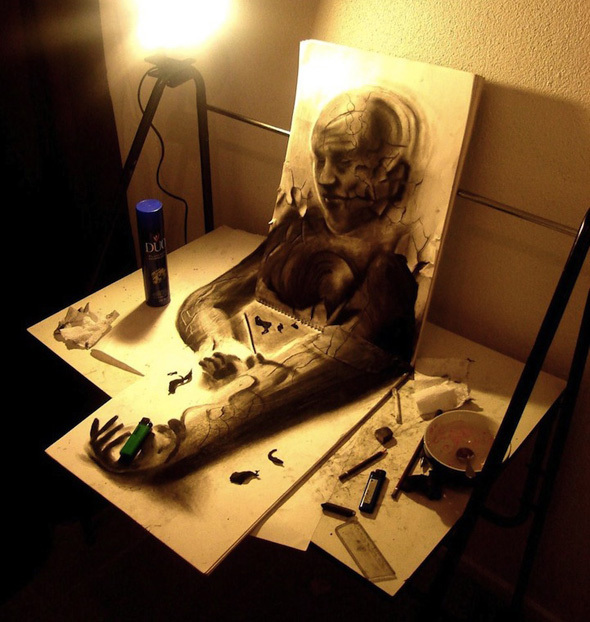 This is really great ART, I see traces of Dali in some of them……. Totally Awesome!!!!!!!!!!!!!!! I loved them! My favorite one was the first one. I can still hardly tell that it is not 3-D!!!!! Wow, just simply WOW, and he is 17. He has a life time to amzae us all. I hope to see more of his work. ……lookn 4ward 2more. nice stuf fredo;!$! Absolutely genius, this guy is going somewhere. 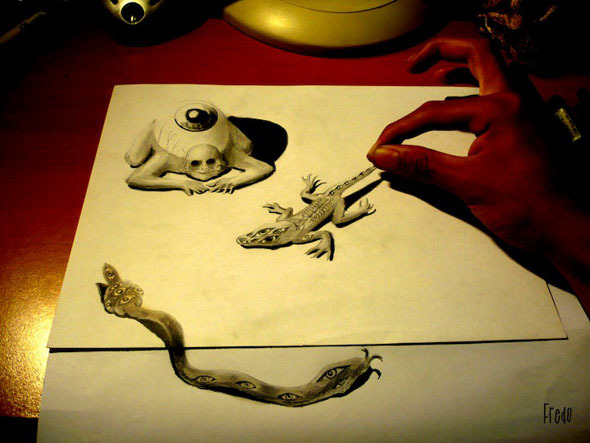 The art is indeed realistic and i love how he uses real life objects to enhance his art and illusion. awesome! the hand one is freaky! i love the one with the hand. i look all pictures 50-60times.these r aaammmmuuuuchhh……i have not other words 4 it.keep it up. *mouth drops. THAT is art at the highest level I can think of. Talk about POP art.! I had to come back and comment ’cause I went back and read the other comments, and noticed ppl mentioning the hand being real. So, I had to go back, and damn sho right that just made this art unexplainable in words. Thank you so much for Each and Everyone…. I will keep my Hard work Up . amazing how did you learn o draw like that??? Fredo, this is amazing! Please contact me if you’ve got no sponsorship right now! Find me on facebook: ANIWURA OMOLAYO. My favourites: the elephant, the man crawling out, the injured hand and the one with a crocodile. i know this guy :) is a friend of my ex, he is so cool! To get the 3D to really pop, close one eye and wait. um its called perspective drawing… been around for awhile. I can conceivably imagine most of these as drawings. But that second one is photoshopped, I don’t care what you say. 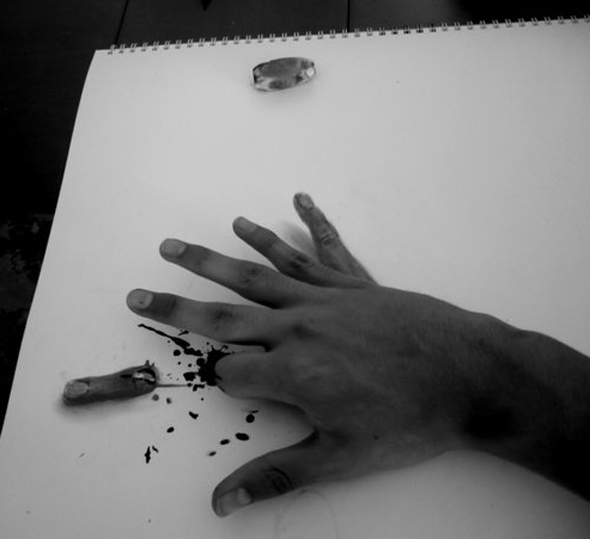 Thats probably why the artist explained that the hand was HIS and only drew the pinky and severed pointer finger! whoa!!!!!!!!!! im lovin these they r so awesum!!!!!!! Amazingly done artwork, really skillful work by this artist. Impressive !! The last one reminds me of a song “i dug a deep black hole in my soal and I jumped right in, saw myself climbing out as i was climbing in”. great song, I just stoped in to see what condition my condition was in. These are just optical illusions. The hand with five of its fingers are real, check the base of the severed finger and you will notice that it is swollen and much bigger than the rest. The sixth finger is not real, check the difference in the coloration of the fifth and sixth finger and you will see the difference. There is also a difference in depth. 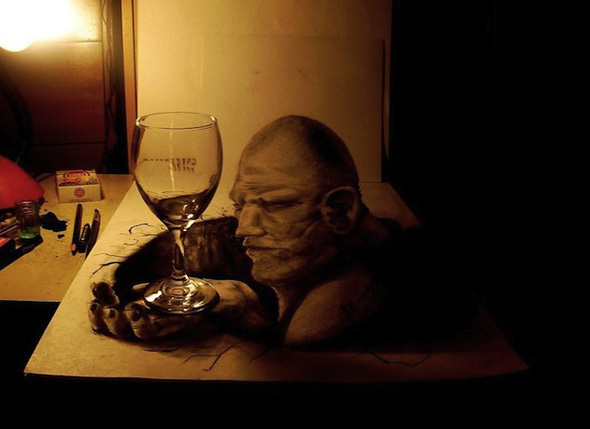 They look really absolutly 3 dimensional – fantastic! Great work, love it!! Yes, yes I can believe that they are flat. Hmph. 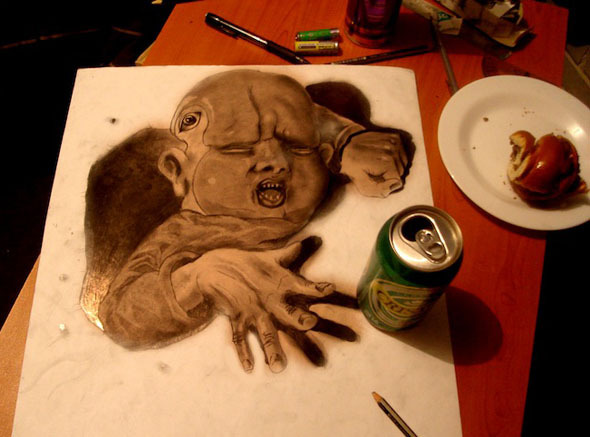 The shading made it dimensional…and it looks like real…. Fredo’s work is amazing. The man climbing out of the hole wouldn’t have his right hand like that though. The hand one with the decapitated finger is bogus. Two fingers are drawn the rest is his own hand. Take a closer look. That’s what it’s meant to be surely – just as in one he has a real lighter, in another he has a real can. In this one he has real hand. It’s not ‘bogus’ because he’s not claiming he drew the whole hand. The fun is seeing where drawing stops and reality begins. Amazing work!! So much talent, can’t wait to see more as he develops his skills. Pateena> the hand was very obviously his own, except for the 6th finger, and the severed one. It was the severed finger that was the focus in that piece. My favorites, the elephant, and then the wee lizard. jesus man how long did it take u? WoW!! This is absolutely incredible, more so to me than you know. I’ve been losing my vision to Retinitis Pigmentosa for years now, there is no cure and I should have been completely blind 25 yrs ago according to my doctors but I’ve still sight in my right eye. I’ve never been able to see anything in 3D prior to now. We go to movies and there are the video games which use 3d as part of the game so I’ve felt kind of like on the outside looking in with my husband and my kids. Don’t get me wrong, they’re very supportive but it’s hard to relate. This is the first time I’ve seen something which is supposedly a ‘figure’ which I couldn’t believe was actually flat drawing. you’ve really made my day. Definitely a talent worth showing off. A career in fine arts or graphic design for gamingi suppose. Keep it up and good luck. That second one is creepy! I thought it was real for a second.